Contrary to how it looks, I have not double crocheted all my scrappy yarn offcuts around and around in loopy loops and then figure eight-ed it around the necks of two of my anklebiters. And the other is 150 stitches round and wider and was accidentally twisted at the very first join. I realised this is precisely what should happen with a cowl, when it loops around a neck twice. Even though it looks a bit strange when it’s off, it sits nice and flat when it’s on. 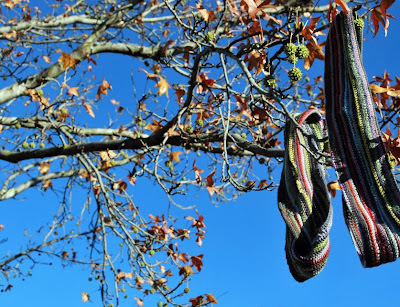 This tree that I am hanging cowls from willy nilly, is the same tree, that me and my girl yarnbombed way back. It sits out the front of our house and these days it’s looking a little on the scuzzy side. Recently, our neighbours were auctioning their house and in the weeks leading up to The Big Day, there was frequent polishing and cleaning of fence posts with toothbrushes, (I truly kid you not) and manicuring of lawns with nail scissors, (I kid you only a tiny bit) and I was beginning to think our scuzzy yarnbombed tree was letting the side down. ...when the neighbour who lives opposite asked me what mischief I was up to this time? This is the same neighbour who is all kinds of wonderful and blinks not an eye when I lie in the middle of the road to photograph snakes. But when I informed him of my grand spruce-up plans, he all but blurted out that he really, really didn’t think my next door neighbour would like that. No. Not one little bit. 1. 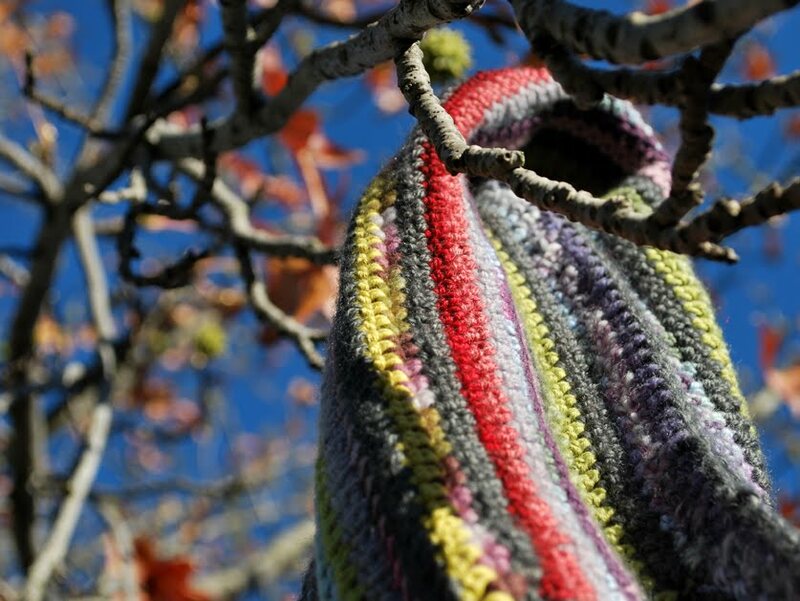 Come over feisty and doily bomb every tree on the street. 2. Come over all neighbourly and focus my plottings on the (poor) school. I’m not sure how much it had to do with the not-clad-in-tablecloth-tree, or my propensity for lying on our road photographing snakes but there was not one auction offer on the house next door. Now, a doily bedecked street of trees would make it a very attractive neighborhood to someone like myself. Or perhaps along with lying in the road, it was the crochet conjoined anklebiters that made the auction attenders a bit wary. I would love to live next to you! hehehe, as long as the tree isn't damaged, i'd say go fir it! 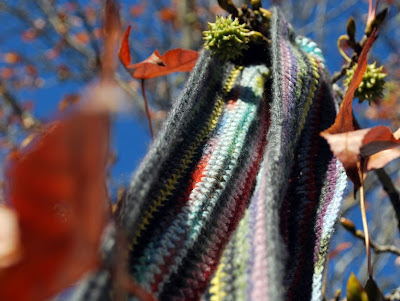 The tree might be thankful for clothes now it's going bald for winter! And your girls are soooo cute! 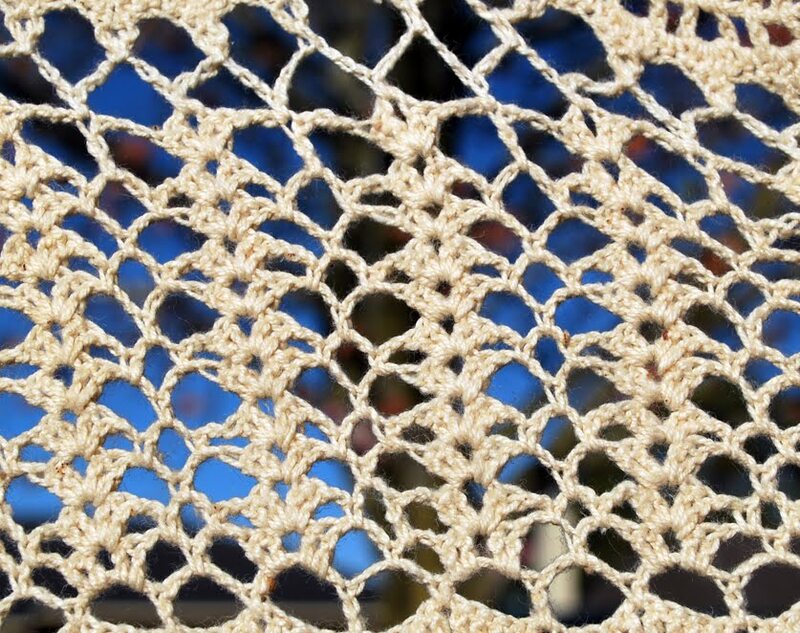 Go on - doily bomb the street!! But as a trained professional in traffic engineering I would avoid too much more laying about in the street (although probably very, very effective in slowing down cars, if there is such a problem in your street)!! That's pretty hilarious, that the other neighbour knew enough about the situation that he blurtingly intervened. Ah yes but who's sorry now the tree went undoilied, hmm? Prospective bidders would have been elbowing each other out of the way to bid higher and higher if there had been a doily in the tree. 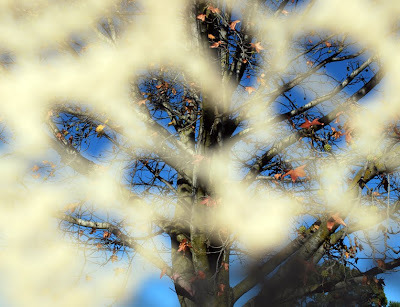 I think everyone needs a doily bombed tree in their street. Silly twits they have no idea what they are missing out on not making an offer on that house. ps..I have seen my neighbour trimming around the water pipes alongside his house with little scissors...bet they are sorry we moved in next door! we are moving to your area in two weeks - feel free to yarnbomb us at any time. We will greatly appreciate it. 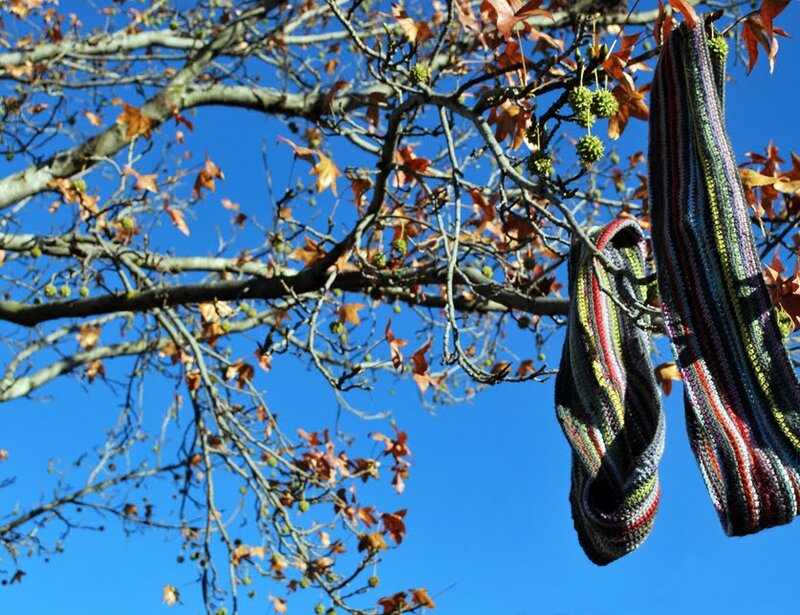 The highlight of our trip to school each morning is going past the 'scarf tree' - a liquidamber wrapped in what was an amazingly long red scarf (slightly scungy now). I say up there for yarnbombing!! I love it when you get mischievous! Obviously nobody was interested in the upkeep of a manicured lawn or a fence cleaned within an inch of it's life! 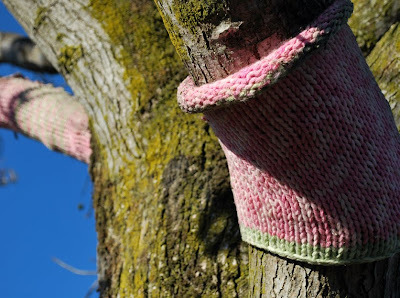 However if yours was on the market with a georgeous doilied or cowl endowed tree i am sure it would be snapped up in a millisecond. That's life..Mr Across-the-Road..get used to it! Now the logic as I see it.... the next door neighbour is leaving clearly can't hack being next to such a talented family poor thing. So it's not his attitudes that the new people would care about - but the neighbours. So doiley the tree and then the people who are shocked and appalled won't buy the house and the people that think "cool! fun neighbourhood, wonder if they have a dinosaur egg?" will buy the house and everyone will get on like they've been friends for life. The house next door to me is up for sale - currently Under Offer. The offerers haven't been round to say hello. Doesn't bode well. Oh you sounds like my perfect neighbour!!! Move here I would love a dolled up tree next door to me and then we can do mine. Tree doilies would immediately identify the address as desirable, if you ask me or others of our tribe. Get mischief making ... quick smart. I reckon that tree needs a doily... and I like that Peppermint Penguin's logic. It's a well known fact that doilied up trees add to the value of the property, no detract from it. i reackon that neighbour of your was up to some of his own mischief when he intervened. Who wouldn't want a house next to a nanna tree? You must live in a very genteel neighbourhood, if crochet be-decked trees are considered beyond the pale! 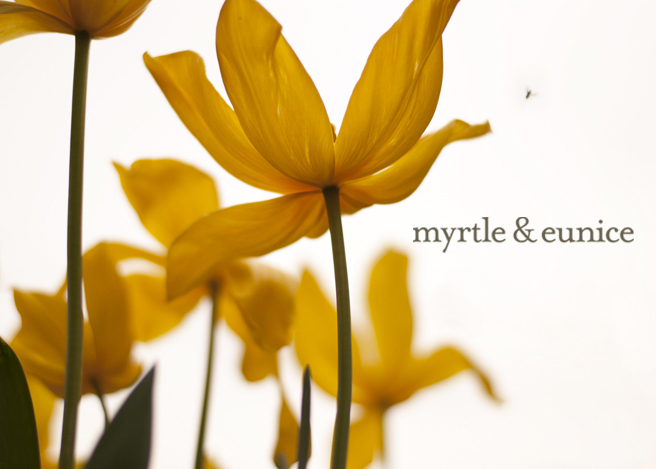 Positively Jane Austen, my dear. I think I would like to move there and develop some over-refined sensibilities myself. Well, no offers on the house, you've done your duty, now doily away! 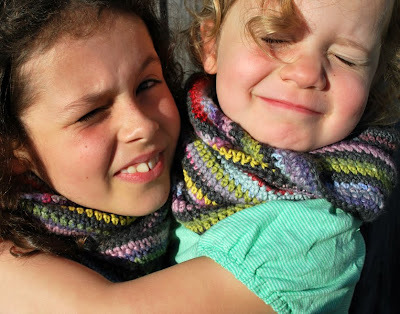 Loving those cowls so much!! We're *that* family in our street too. Hooray for mischief making, I say! 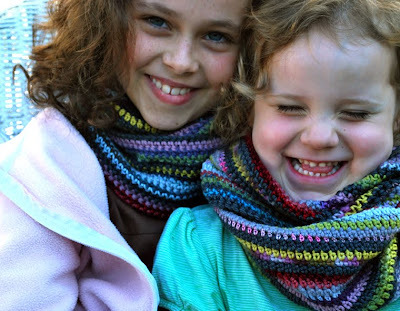 Love the cowls! They are adorable...and so are the children! My goodness, you were really going to don the tree with a lacey table cloth...oh my..you just seem like my kind of person! Just so you know, a friend of mine has now made boyfriend hats for two of her children and her husband. Enabler! Don't feel guilty . Lack of tree embellishment wouldn't have scuppered the sale . It'll have been the odd whiff of Colgate in the garden . I'd pay extra to live next to smiles like these ! I say take off and doily bomb the site from orbit. It's the only way to be sure. love the cowls. Sounds like a bit of Karma to me about the house. A doilied tree would be a clincher for me. And you can be my neighbor anytime :) I have a tree that would be very happy to have some doily goodness, and a blowhard of a neighbor that I'd be happy to piss off. I love how colorful these are. Do you have a pattern that you used and would recommend?